The Indian space agency ISRO successfully launched three satellites, including the joint Indian-Russian satellite Youthsat for stellar and atmospheric studies. The Indian space agency ISRO on April 20, 2011 successfully launched three satellites, including Resourcesat-2, an advanced remote sensing satellite to study natural resources. ISRO's satellite launch vehicle was also carrying the joint Indian-Russian satellite Youthsat for stellar and atmospheric studies and Singapore's first satellite, X-Sat, a mini satellite for imaging applications. 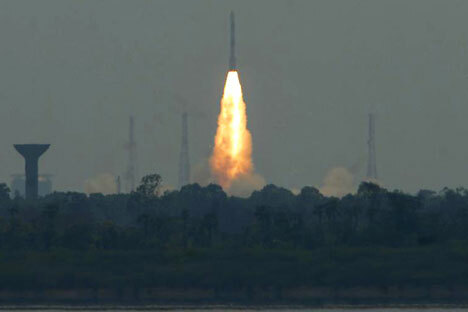 The Polar Satellite Launch Vehicle (PSLV) took off from the Sriharikota launch site in eastern India in a dramatic success for the Indian Space Research Organization after a series of failed launches. Resourcesat-2, the mission's biggest satellite, will replace Resourcesat-1, which was launched in 2003. India is looking to emerge as a global player in the lucrative satellite launch market.